Late on March 19, dust storm (mild) has engulfed many cities of Sindh including Karachi and Sukkur. The storm has originated from the desert regions of Balochistan, fresh western disturbance ’27’ is also passing over the northern areas of the country due to which change in wind pattern has occurred in the province. Dust storms even the mild one can cause health problems like difficulty in breathing and irritation in eyes, precaution is required till the storms continues. The current dust storm has further moved eastwards and is dissipating, it is no more important! Sindh is now not under the influence of the dust storm however weak dusty winds are still hovering over the province including Karachi, the storm has shifted eastwards. Gujarat, Rajasthan and adjoining Punjab is now experiencing the mild dust storm. Sand/Dust storm is also occurring in Islamabad (highest wind speed was 40 km/h). It was the same dust storm that affected Iran, Afghanistan and parts of Oman and UAE few days back. 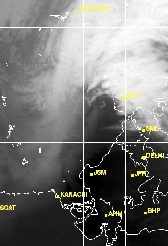 Wind speed has increased to 50 km/h in Karachi. All flights are grounded at the Jinnah Airport. The dust storm is because of the western system that is present over northern Pakistan, it is causing isolated hail/rainfall with strong winds in Khyber province. 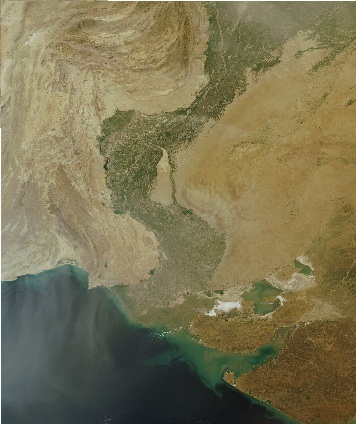 Below is the satellite image of the country. Flights from Karachi to interior Sindh suspended. Dust storm affecting Larkana, Hyderbabad, Jamshoro and other cities of Sindh. However it is a still mild storm that would ease by tomorrow mid-day/evening. Winds in Karachi now gusting to 42 km/h. Humidity in Karachi has dropped from 66% to just 16%. Visibility has also dropped from 0.8 km to 0.2 km. 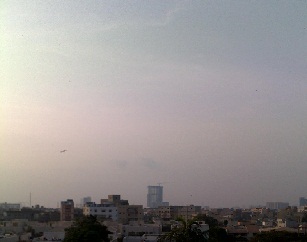 Winds in Karachi are from north-west direction, they are ranging from 20 km/h to 37 km/h. Visibility has dropped to zero, night temperature also expected to drop. ← Will Rainfall threaten Indo-Pak Match? when monsoon started in sindh?? It has started, 1st and 2nd spell occurred in SE Sindh, however it failed to advance westwards..